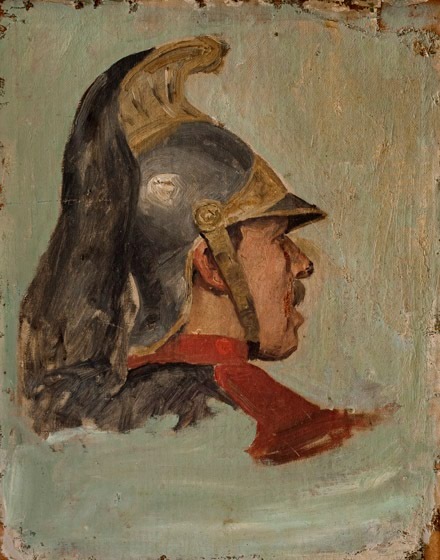 This small unfinished sketch has sometimes been identified as a “Prussian Officer,” though it seems more likely that it is a French dragoon. It may be a work that Trego did in Paris, though there is no certain way to tell, especially since the original stretchers are lost and the back of the painting can no longer be searched for clues. The sketch can be seen on the wall of Trego’s studio in the photograph taken there in 1901. Obtained from the artist or his estate by Walter E. Baum; Inherited by Robert “Bert” Baum; Purchased from Bert Baum by husband of current owner. The edges of the canvas are rough and ragged. It was at some point roughly removed from its original stretchers and mounted on Masonite. There are some surface abrasions and some paint losses, and it is in need of cleaning.